In an apocalyptic future where Zombies have infested the planet, 3 heroines fight to save humanity from utter doom. 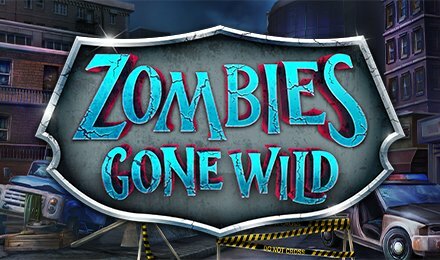 However, as the days go by the Zombie Hunters will need all the help, they can get to rid the city of the undead in Zombies Gone Wild Slot by Pariplay! You can discover this terrifying 5 reel and 50 payline slot game at Vegas Spins! The game has an entertaining gameplay that will captivate and immerse yourself in the action. It has a post-apocalyptic setting with desolate buildings, vehicles, and roads. On the reels, you will find the 3 Zombie Hunters, zombies, radioactive disk, alphabets K, A, Q, J, and the number 10. Before starting the game, you will need to register an account at Vegas Spins. If you already have an account, then just log in to play the game. The next step is to adjust your bets by clicking on the + and – icons at the bet section of the screen. Near the SPIN button, you will find the AUTOBET feature. You can set bet limits in the game, such as single wins, win limit, loss limit, and the number of rounds. Click on the spin icon to start. Coin Values: The minimum value is £0.50, and the maximum value is £25.00 respectively. You are provided with new pay-out options with this feature, as the 3 Zombie Hunters get infected with radiation and transform into wilds. By landing 3 Radioactive Bonus Scatters on the reels you open the Free Spins Round. When you unlock the Free Spin Round with 3 Bonus Scatters, you pick up between 6 to 20 free spins. The Zombie Hunter Wilds also increases your chances of winning, and you can also enter this round up to 3 times with more chances of getting more free spins. If you pick up a winning combination with a wild, it will fill the Zombie Hunter Meter. Each hunter has her own jackpot meter and landing a wild with one of the hunters on will fill the corresponding meter. Filling Kira’s meter will give you 25 times your stake, Tarra’s meter you get 75 times your stake, and Lucy gives you 200 times your stake!